Symantec Endpoint Protection currently blocking IRL Windows app. Create an exception in the application to avoid the issue. Currently working to update Symantec trusted database. IrishCoin Internet Radio Advert Campaign begins again. We’ve always found internet radio advertising to be a great way to promote IRL to people who are not too informed on the crypto scene. Irish media like liveIreland, IrishAmericanNews, and IrishPub Radio fit the bill when it comes to promoting Irishcoin to the Irish diaspora at home and abroad. From this weekend our partners at liveIreland Radio starts our pre-Christmas campaign followed by IMR radio and some Irish blog promotions as well. (more on this later) Along with our cointopay POS rollout, we hope to inform Irish audiences of the potential discounts and purchases available from IRL outlets. IrishCoin Deposits are open on NovaExchange. 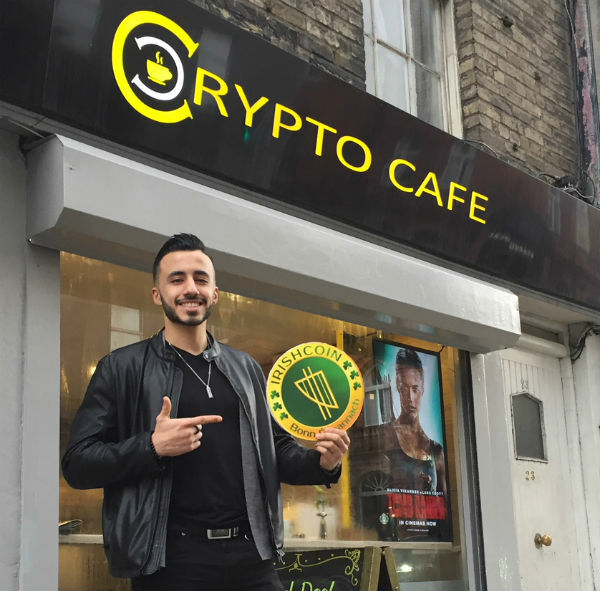 IrishCoin and the all-new CryptoCafe on Aungier Street in Dublin will be giving away €5 worth of IrishCoin (IRL) to the first 20 customers for every purchase of coffee in store. Just call in and ask for your IRL on the day! Slainte! The IrishCoin team will be rolling out it’s updated digital wallets in April so you can buy Coffee in IRL at the CryptoCafe and other outlets in Dublin. CryptoCafe was opened in Dublin by Crypto investor and enthusiast Nash Basel as a new way of selling coffee via digital currencies. The concept has taken off especially from a marketing perspective and the store emulates this with screens showing the latest crypto prices via coinmarketcap. The gourmet coffee and in-house bakes are exceptionally and good and seem to be giving Starbucks across the road a run for their money, or crypto as the case may be. IrishCoin Adverts to feature on 3 top Irish Radio Stations in Run up to St Patricks day. IrishCoin Adverts to feature on 3 top Irish Radio Stations in Run up to St Patrick’s day. IrishCoin advert rolls out across 3 online radio stations in Ireland in the run up to St Patricks Day including Ireland’s No1 leading Radio station liveIRELAND Radio one playing to over 50,000 Irish individual music listeners worldwide every day. IrishCoin: Ireland’s Cryptocurrency Coin & Exchangeable Token?